The UIC co-ordinated campaign “Train to Paris” will bring delegates including national governments, NGOs, decision-makers and journalists from across Europe and Asia by train to Paris for the COP21 United Nations Conference on Climate Change to be held end of 2015 in Paris. Train to Paris campaign will climax at its main event on 28 November. Together let’s build a more sustainable future! Together, let’s take the Train to Paris! What is « Train to Paris »? “Train to Paris” is a synchronized network of trains planned to arrive in Paris from across Asia and Europe, with some trains originating from Mongolia, Russia & China. The aim of this Worldwide Campaign is to raise awareness of the important role of sustainable transport, and low carbon rail transport, in the solution to both climate change mitigation and adaptation. A series of high-level and media events are scheduled to take place end of November 2015 in Paris, including a symbolic welcome of delegations on arrival in Paris and discussions during a high-level Round Table. November 28th 2015 but some trains and/or delegations will depart on the 27th - and even on the 18th of November from Beijing. Paris, France – host city of the United Nations Conference on Climate Change “COP21”. Trains will arrive in Paris in Gare de l’Est and Gare du Nord (subject to change depending on various requirements). The trains will bring delegates including representatives from national governments, NGOs, but also decision-makers and journalists. Trains can be boarded by invitation only but they will anyway be on their regular service with delegations related to the “Train to Paris” Campaign on board. Promote freight and passenger rail as a sustainable, low carbon solution to climate change. Share with the general public that railway is really one of the backbones to fight climate change. 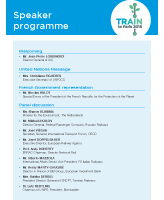 Secure positive references to rail transport in COP21 documents, negotiations & press coverage. Encourage decision makers to adopt long term credible & consistent policy in support of rail.